Fewer menu options, but more topping options. McDonald’s is taking its menu in a different direction — one that’s a little more trim — in order to stanch the bleeding at its bottom line. For years, various groups have raised issues and questions about what goes into a McDonald’s meal. 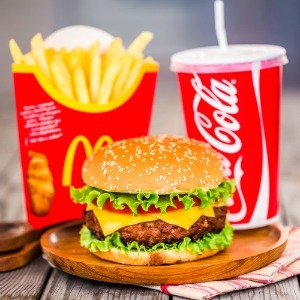 But with sales down (since October 2013) and the competition taking continuous nibbles out of the fast food giant’s consumer base, McD’s is putting some more significant measures in place. To start, the menu is getting smaller. The company is ridding itself of all but one version of the Quarter Pounder with Cheese burger. There will only be one Snack Wrap left on the menu. And there will only be one chicken sandwich. There will also be fewer ingredients in their food. All of this is being tested in six markets. And speaking of ingredients, McD’s has decided maybe it’s time to let people know what’s in their meals. At this point, you’ve probably heard that McD’s has been trying to be more transparent about what’s in its food, bringing in former Mythbusters host Greg Imahara to visit food-processing plants to give viewers insight into what they’ve been eating all this time. In the latest, for instance, Imahara went to the Tyson Foods plant in Tennessee to take a closer look at Chicken Nuggets. To confirm: there is no pink slime, beak or chicken foot in the Nuggets. They say it’s just chicken breast. Whew! Taken a step further, McDonald’s plans to let customers do a little more deciding on what goes into their meals. Picking up on the customization trend at Subway and Chipotle, which lets diners pick each item that goes into their lunch, McD’s is going to give more topping options in a couple thousand of its restaurants by the end of next year. These changes are significant, but there are questions about the results it will yield. The goal is to lure back younger customers and mothers who have gone elsewhere in search of a quick meal that doesn’t pack in calories, preservatives and is sourced from places that are recognized as food purveyors, like farms and whatnot. McDonald’s has a very processed reputation and the video below, while it does settle some fears, doesn’t really dispel that. There’s still something very lab-like about the McNugget’s origins. It’s animated, but take a look at this now-iconic ad for Chipotle. It makes their food look simple and identifiable. Not to mention the emotion in the scarecrow’s face, the sadness in that poor cow’s eyes and Fiona Apple’s lovely and haunting voice. The clip gives the impression that eating at Chipotle is good for you and good for the environment. As Mellody Hobson said on CBS This Morning, you can’t declare McDonald’s dead. But they have to realize that these steps are initial ones. The company has some more work to do to catch up with the ways in which more people are eating.